I’m pleased that women’s footy has got to the point where it is so recognised. Adelaide’s reigning Club Champion Chelsea Randall has taken out the highest sporting honour at the University of South Australia. Last week, she was awarded the Georgie Rowe Outstanding Achievement Award. This is on the back of an outstanding AFLW season in 2018, where Randall courageously led from the front in every game. 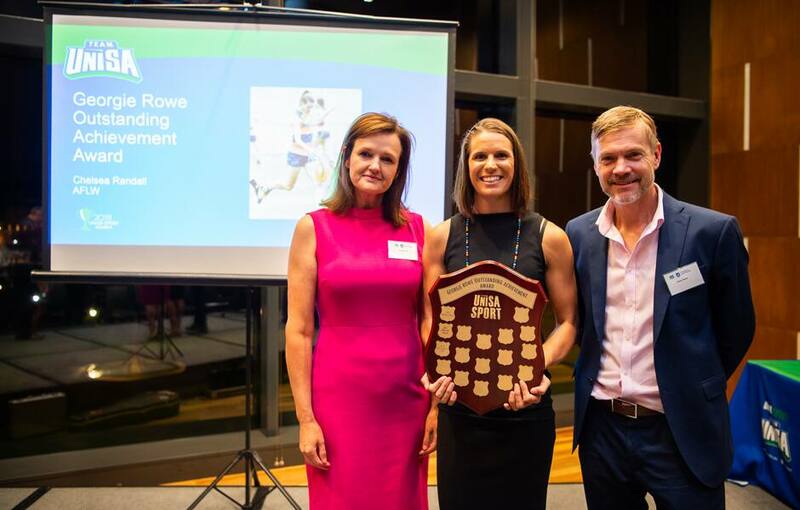 The award tops off a long list of accolades for 2018, after she was also named the joint winner of the AFLW Coaches Association Award and the All Australian captain. She was also voted by opposition players as the AFLPA Most Courageous player and by her teammates as Player’s Player, both for the second consecutive season. Georgie was a member of the Australian Women’s Volleyball Team in 2015 and 2016 and was a recipient of a Green and Gold medal at the Australian University Games in 2015 when she was representing UniSA. Peter and Fiona Rowe – Georgie’s parents – presented Randall with the award at the UniSA Sport Awards Night held at Adelaide Oval. Randall, who is studying a Bachelor of Education with the university, said it was an honour to receive the award. “I feel really proud to have won this award in Georgie’s name,” Randall said. “I’m pleased that women’s footy has got to the point where it is so recognised. The University of South Australia is a premier partner of the Crows.